At APEX in Boston, SkyLights announced their partnership with STELIA Aerospace for their premium inseat cinematic VR IFE solution. STELIA is one of the leaders in the field of Business and First class passenger seats The new product combines SkyLights’ Allosky headset, STELIA’s new Opal business class seat and InSeat Solutions’ interactive massage system. The combination of these products provides an unparalleled 4D experience and simplifies the logistics of SkyLights’ entertainment. We tried the Allosky headset and were blown away by the Full HD virtual experience. The audio system is linked into the seat so the massage system, which is equipped with an audio vibration mode, delivers content-synchronized vibrations for a truly immersive interactive experience. As well as upgrading the passenger experience, the inseat solution reduces the logistical complexity and cost of VR IFE for airlines. The devices do not need to be loaded/off-loaded when an aircraft is at its base and can be cleaned onboard by the same crew that cleans the aircraft. SkyLights stated that the new in-seat solution is planned as a line-fit product for airlines that are seeking to upgrade and differentiate their upper-class passenger experience. Airlines looking to implement the benefits in a shorter term, the SkyLights entertainment can be integrated into existing seats certified on a fleet-by-fleet basis. Alaska Airlines will be the first airline in North America to implement the Allosky VR headset. The inflight experience has 2-D and 3-D screens and forward-facing 360-degree films will be available in the airlines’ first-class service on the Seattle-Boston and Boston-San Diego routes. FTS had several significant announcements that were unveiled in Boston. First, FTS and Global Onboard Partners announced their agreement to collaborate to promote, design, and offer a seamless inflight entertainment and ancillary revenue service for airlines around the globe. FTS is a provider of wireless IFEC solutions and Global Onboard Partners is a provider of inflight advertising products. The two will combine their patented onboard technologies, hardware and products in an effort to provide airlines with a comprehensive revenue generating IFE solution. Additionally, FTS announced their partnership with Qingdao Airlines of China, a private company, to equip its fleet of 14 A320 aircraft with XStream-SAT Broadband Connectivity system. This arrangement is achievable with the Civil Aviation Authority of China’s relaxation of regulations in early 2018, allowing passengers to use smartphones during flight. One of the primary topics of discussion from Viasat during APEX was the selection of Aeromexico of the ViaSat Ka-band satcom solution for 18 of their B787 MAX, 16 B737 MAX aircraft are new. The first line-fit installations have already begun and there are options to extend the agreement to 60 other jetliners in the Aeromexico fleet. According to ViaSat the airline evaluated the Viasat inflight internet service and selected them based on its proven, scalable network platform. Furthermore, the ability for them to tap into the ViaSat-2 satellite and future satellites, like Viasat-3, provides the airline with greater inflight Wi-Fi reliability, faster onboard internet speeds, better internet performance, and a futureproofed approach to inflight Wi-Fi. As the Viasat technology is both forward and backward compatible across all of Viasat’s spacecraft, ensuring that the Aeromexico’s jetliners can stay connected. La Compagnie Business-Class Airline partnered with Viasat to offer inflight connectivity to the boutique airline’s twice daily flights between New York and Paris. The airline’s A321neo aircraft will be installed with high-speed Wi-Fi Capabilities and will enter into revenue service in April 2019. The satellite design and its ability to meet the connectivity demands in high-density areas like major airport hubs and congested air corridors appealed to the boutique carrier. SITAONAIR forged an agreement with Etisalat, a mobile network operator, to transform how inflight cellular services are offered to airline passengers. Etisalat is based in the United Arab Emirates and allows subscribers of their business roaming packs to use their data and minutes inflight as part of their bundle with no additional fee. This new roaming agreement provides their travelers with a seamless mobile connectivity experience whether they be on the ground or in the air. 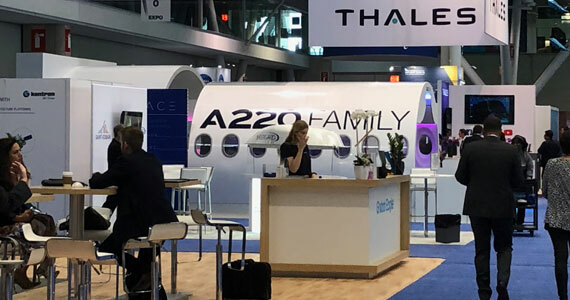 New Caledonia-based airline, Aircalin, also chose SITAONAIR for their in-flight connectivity solution. The airline will install their A330-900s and A320neos over the next 3 years. Panasonic Avionics Corporation (Panasonic) has appointed Donny Cheah, as Regional Vice President, China. This strategic hire will bolster Panasonic’s presence in China which is the fastest-growing region in the world for air travel. To date, Panasonic has sold more than 2,000 inflight entertainment and connectivity solutions to airlines based in this region. Donny will also serve as the president of Panasonic Avionics (China) Co., Ltd. (PACN) which will be newly established in Shanghai, China this year. In his business management role, Donny will oversee account management, customer support, repairs & maintenance, media & creative services, along with the service functions of quality, human resources, IT, and customs compliance in the China region. Astronics announced that it has joined the Seamless Air Alliance as an “Adopter Member. ” The Seamless Air Alliance is a consortium of companies dedicated to the development and promotion of aircraft connectivity standards to facilitate a simple, delightful experience for passengers. The goal of the organization is to create standards that ensure continuous connectivity from gate-to-gate anywhere in the world with the additional potential benefit of reducing the hurdles associated with the acquisition, installation and operation of inflight connectivity systems. Astronics FliteStream: The company also announced that its wholly owned subsidiary, Astronics AeroSat, is introducing its next generation FliteStream T-310 SATCOM connectivity solution for business aircraft. Astronics is offering the FliteStream T-310 solution to the business aircraft market in partnership with Satcom Direct (SD), the launch customer, as part of its SD Xperience end-to-end solution. The T-310 is fully qualified and approved to operate on the Intelsat FlexExec business aviation network. The FliteStream T-310 SATCOM connectivity solution includes the next generation iDirect CX780 modem, providing compatibility with both Ku-band wide beam and high throughput spot beam satellite (HTS) networks. Gogo Business Aviation has surpassed 5,000 systems activated across the AVANCE platform and its other ATG (air-to-ground) systems. Presently, Gogo has nearly 450 Gogo AVANCE systems flying on business aircraft, including AVANCE L5 and L3, which is the fastest adoption of connectivity systems across the broadest range of business aircraft models in the history of business aviation. AVANCE L5, Gogo’s solution that can provide bandwidth-intensive activity such as streaming video, has been in the market for a little more than a year. To date, Gogo has more than 350 L5 systems installed and activated, with an additional 300 that have been shipped. AVANCE L3, which began shipping earlier this year, continues to gain momentum and is expected to reach 100 installations by mid-November, less than one year after launch. Since the start of the year, the AVANCE L5 system has been in use on more than 28,000 flights, delivering a 4G experience that allows heavy-bandwidth activities such as streaming video, video conferencing, email with large attachments, and fast web browsing. Connectivity is often the biggest influencer on passenger satisfaction today. Passengers on business aircraft expect reliable, seamless connectivity, but they also want visibility into the performance of the connectivity systems on board their aircraft. To help provide greater insight and better diagnostic tools, Gogo Business Aviation is introducing Gogo DASH, a powerful new toolkit that gives operators and pilots visibility into the Gogo network and the connectivity systems they have installed on their aircraft. Gogo DASH is comprised of the DASH mobile app and DASH portal and provides information for a single aircraft or an entire fleet. Moscow Domodedovo Airport and S7 Airlines have implemented SITA’s Scan&Fly self-bag drop technology, providing passengers with a faster, more efficient process to check-in their own bags. The process takes less than a minute. The technology was developed by SITA, the world leader in IT and telecommunications solutions for the air transport industry. The self-bag drop solution was tested on S7 check-in counters since early September and positive feedback was received from more than 1,000 passengers that used the service. By the end of the year, 24 check-in counters at Domodedovo will be equipped with the self-bag drop technology, allowing other airlines to use the service. Scan&Fly will accelerate and simplify the check-in process for passengers. Equipped with a document scanner and a hand-held infrared barcode reader, it takes only three simple steps for passengers to check-in a bag. First, the boarding pass barcode (printed or digital) is scanned, a bag tag is printed and then the passenger attaches the tag to their bag before depositing it for processing. ATPCO and SITA announced that British Airways, Delta Air Lines, United Airlines, the airlines of the LATAM Group, and Finnair will participate in NDC Exchange, a platform that enables content interoperability across the airline distribution ecosystem and is a trusted bridge between IATA’s NDC (New Distribution Capability) and traditional distribution methods. “By connecting to NDC Exchange we have access to these first movers, as well as other airlines as they join. By building a single connection to NDC Exchange, we are being more efficient with our development resources, letting us focus on customer experience rather than content acquisition. We’re excited about the momentum this is getting and can’t wait for the next airline,” said Rich Miller of Serko, an industry-leading corporate booking tool. NDC Exchange is a community platform that enables API connectivity between airlines and sellers (GDSs, travel agents, aggregators, OTAs, and TMCs) so that they can exchange messages easily and cost effectively. NDC Exchange supports shopping, booking, and servicing workflows and enables the cross-selling of ancillary services between airlines, and among airlines and sellers. Using a common data model, it normalizes messages regardless of version or format, creating interoperability across the distribution ecosystem. Travel sellers can access multiple airlines via NDC Exchange, hence lowering the cost of their implementation. As world leaders gather in Bali for the IMF-World Bank Group meetings, PT Angkasa Pura I Persero (AP1), which operates 13 airports across Central and Eastern Indonesia, announced that it will be leveraging world-class technology, from air transport IT provider SITA, to manage the country’s rising passenger numbers. The commitment to leverage world-class technology was reiterated through a partnership signing event, between SITA and PT Angkasa Pura Supports (APS), AP1’s subsidiary company, held at I Gusti Ngurah Rai International Airport today. Indonesia is the biggest aviation market in South East Asia with more than 110 million passengers in 2017 and it is growing rapidly. By 2036, Indonesia is expected to be one of the top four markets globally with a forecasted 355 million passengers. The economic and social benefits of aviation are well recognized and SITA’s proven airport technology will support AP1’s vision to run world-class operations providing a great passenger experience during this period of rapid growth. Since 2014, SITA has provided AirportConnect Open to AP1. This common-use platform enables carriers to operate smoothly at AP1’s 13 airports, including at two of Indonesia’s busiest and award-winning airports Denpasar (Bali) and Surabaya. This platform also enables the future introduction of SITA’s self-service check-in kiosks, bag-drop and boarding gates; and SITA ControlBridge, which seamlessly integrates the command and control capability of an airport to deliver efficient operations. You might find this interesting: Flyht Weather Solutions, Canada acquired assets of Panasonic Weather Solutions from Panasonic Avionics.